We are concerned that Airtime Airlines had a false start. We'd like to see their planes actually in the sky before we start booking. Flight reservations - purchase minutes! You need to book your flight within the Airtime Window (was 1 month when we last checked). 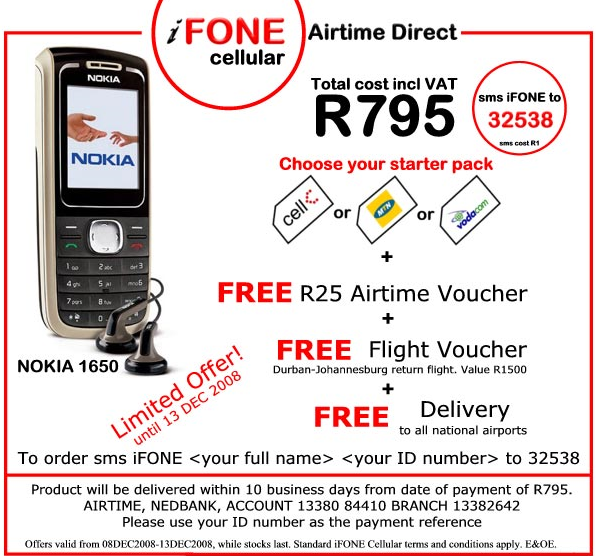 SMS TOPUP <minutes> to 32FLY (SMS costs R1.00, free minutes do not apply). Phone 0861-002FLY between 8am and 8pm to book. Airtime Airlines is leasing 3 118-seater Boeing 737-200s from AirQuarius Aviation. The plan is to later change to an Embraer fleet (which is more fuel-efficient). It is rumoured that provisional orders have been placed for Embraer 175 and 190. Its loyalty program, iFLY Airtime, is planned to be launched in 2009. Members will earn airtime for each flight (which can be redeemed for cellphones or flights). There are 2 tiers of membership, with different sets of benefits. Koomaresen Eargambram (also known as Vino) is Chief Executive Officer of Blackbird Aerospace Corporation, as well as being responsible for commercial operations of Airtime Airlines. Airtime took over much of the office space and airport counters previously used by Nationwide Airlines. A whois on www(DOT)flyairtime(DOT)co.za indicates that the domain is owned by Blackbird Aerospace Corporation (Pty) Ltd, with a postal adress at Blackbird Aviation Centre, 2A Jan Smuts. The billing address is to Interprise (Pty) Ltd, with email uniforum@interprise.co.za, postal adress "PO Box 1161, Rivonia, 2128" and phone number 011 560 9000. Under which licence and certificate does Airtime operate? Blackbird Aerospace Corporation and AirQuarius Aviation have a commercial agreement whereby Blackbird Aerospace (for Airtime Airways) is allowed to use AirQuarius Aviation's license from the Air Licensing Council of South Africa (ALC) and Air Operating Certificate from the Civil Aviation Authority (CAA). Similarly to the arrangement between Comair and Kulula, whereby Kulula operates aircraft under Comair's licence; Airtime Airlines is simply the trading name. AirQuarius Aviation is a Lanseria-based aviation company. The Chief Executive of AirQuarius Aviation is CGavin Branson. It seems that Airtime Airlines are not planning on applying for membership of IATA (other low-cost carriers like Ryanair and easyJet are also not members). It is not clear who owns Blackbird Aerospace Corporation, but it is likely to be at least partically-owned by Koomaresen Eargambram, and speculation is that a player in the cellphone industry is involved (speculated to be Durban based iTalk cellular). 1time wins a court case preventing Airtime from using the word "time" in its name, the colour red for its marketing or the "ifly Airtime" logo. Desmond O'Conner, 1time's Commercial Manager says "We just want to distance ourselves from them as much as we can and get people to be fully aware that 1time is in no way connected with Airtime whatsoever". Commercial flights were scheduled to begin between Durban and Johannesburg (3 daily). South Africa's Department of Transport's Air Services Licensing Council says that Airtime Airlines does not hold a domestic licence, and has "called upon Airtime Airlines to follow the legislative requirements before engaging in any air operations, including the sale of air tickets". Commercial flights were originally scheduled to begin between Durban and Johannesburg (3 daily)...but date later changed to the 30th Jan 2009. The Department of Transport's Air Services Council accepts Airquarius's application to operate a scheduled air service in South Africa. Airtime Airlines website is up and running for the first time, offering a Durban to Johannesburg return ticket and a R25 airtime voucher for R795. Here's a screenshot of the Airtime Airlines website. The website was designed by Dragan Grafix. Airtime Airlines plans to give South Africa's CAA and Air Licensing Council of South Africa the mandatory 14 days notice that it will be operating flights under AirQuarius Aviation's licence. The Airports Company South Africa (ACSA) says that it has not been formally approached by Airtime Airlines for landing and takeoff slots. South Africa's Civil Aviation Authority (CAA)says that it has not yet granted Airtime Airlines an operators certificate (although it later became apparent that Airtime would make use of AirQuarius Aviation's licence). Airtime Airlines starts sponsoring the East Coast Radio's Top 100, and their logo is displayed for the first time on the East Coast Radio website. the Independent Online group tells the world about Airtime Airlines in a news story. The Times writes a story about Koomaresen Eargambram, South Africa's first black pilot who's dream is to open a domestic airline. Blackbird Aerospace Corporation comes close to purchasing the remains of Nationwide Airlines, before the deal collapsed over a dispute regarding unused tickets (Blackbird would not agree with John Cameron's - former Nationwide CEO Vernon Bricknell's attorney - demand that R71m in unused tickets should be underwritten by Blackbird). Koomaresen Eargambram resigns from SAA to take up a position as chief executive of Blackbird Aerospace Corporation (the initial plan was to expand Blackbird Aerospace Corporation into flight training for pilots and cabin crew by buying out the Natal Flight Academy (the oldest flying school in the KwaZulu-Natal Province of South Africa). Koomaresen Eargambram becomes the first black pilot in the South African Air Force.